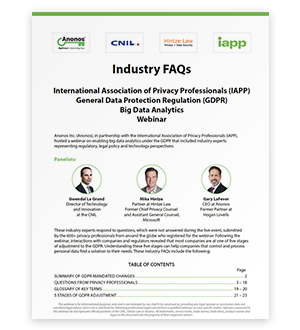 Read Industry FAQs from the webinar featuring French CNIL and ex-Microsoft Chief Privacy Counsel - over 600 of your colleagues registered! GDPR requires more than privacy by design - it mandates data protection by design and by default. Data assessments and inventories alone or not enough. Encryption alone does not support analytics, artificial intelligence or machine learning using personal data.